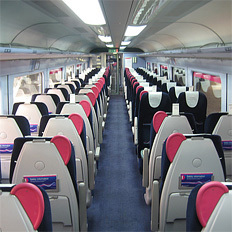 What's the difference between private train hire and large group travel on scheduled trains? Private train hire means that you can travel directly to your destination in a train just for your group, without changes (even if you would have to change if you were travelling in a normal scheduled train). With large group travel on scheduled trains, we reserve or attach private rail carriages for your own use or arrange for your group to sit together in a normal, public train. Whether to hire a private train or have private carriages in a public train? We will advise you which is the most cost-effective for your particular group and route. How to hire a private train or organise large group rail travel on a public train? Hiring a train or arranging group travel is simple with us because we manage everything for you. A single contact will handle your booking from start to finish, advising you on costs and options, and will then book and arrange the train travel for you. As with most forms of travel, costs vary on a number of factors including the length of journey, travel date and time of day. We will offer you the most competitive costs for your journey using the most appropriate rail travel service for your particular requirements. To find out more, please contact us with your journey details. Yes. We offer corporate, incentive and hospitality train travel packages for any purpose including trains to sports events like Royal Ascot and the British Open, wedding transport by train, and luxury train travel in the UK, Europe & USA. We also help film production companies find locations for filming on trains, including railways stations and historically appropriate train stock. For more information about these services, please visit our main group website at www.trainchartering.com.